Today I have some swatches of OPI's new Oz The Great and Powerful Collection. This is OPI's yearly Soft Shades offering, just in time to make the transition between winter and spring! Don't Burst My Bubble is my favorite of the non-glitter polishes in this collection. I was expecting Glints of Glinda to be my top pick, but when I put this one on my nails, I fell in love. 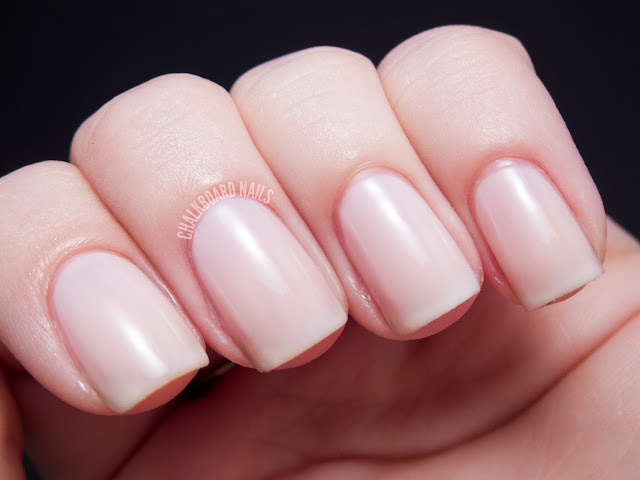 This soft white jelly shade is tinted with just a touch of pink, and it makes my nails look so clean. I needed three coats for the swatch below and found the formula to be smooth and glossy. It's. Just. So. Pretty. Lights of Emerald City is a fantastic glitter. This feels like a venture into the "indie" aesthetic for OPI and I am loving it! This glitter is made up of iridescent squares that shift from blue to orange-gold and larger white squares. It's a pretty simple combination but I think the result is really striking. The glitter density was workable; it wasn't the easiest polish I've ever used but it definitely wasn't actively frustrating to apply. I layered it over Don't Burst My Bubble. I Theodora You is a light candy pink shade. I wouldn't describe it as a creme but it is a bit more opaque than Don't Burst My Bubble and Glints of Glinda. I still needed three coats, but the final look was more solid. I liked the way this looked on my nails and had no troubles with the formula. Which is Witch? is the best glitter in this collection, in my opinion! This clear based polish is packed with smaller pieces of silver holographic glitter, including hexes, microglitters, and short bars. Which is Witch has great density, needing only one coat to add a nice amount of sparkle. It shines beautifully in the light and looks great when paired with any of the Oz jellies. I've shown it here with I Theodora You. Glints of Glinda is a tan jelly shade. While I liked the consistency of this polish, I think the shade was too close to my skin tone for me to go gaga over it. Still though, it's a great polish and I think it would look beautiful on someone a bit more tan or darker-toned than I am! Three coats shown below. When Monkeys Fly! is a clear based polish with large metallic gold hexes and smaller silver holographic glitters. Unfortunately, this one is a bust for me. As I'm sure many of you have seen by now, the gold hexes curl badly. Not only do they have the appearance of curling when you look at them, but they also physically curl up off the nail. Even after topcoating, they will sometimes still poke out a bit. I appreciate what OPI was going for here, but I think this was a miss. Shown over Glints of Glinda. I took this shot to try to demonstrate the curl. You can see it best on my pointer and ring fingers. What Wizardry Is This? is the Liquid Sand accompaniment to this collection! This brown shade has a nice bronze shimmer to it. I thought it looked a bit like distressed leather once it had set! I needed two coats for the opacity below. My picks for this collection are Don't Burst My Bubble, Which is Witch?, and Lights of Emerald City. The Liquid Sand is also nice but I found that I preferred the effect of some of the Mariah Carey Collection Liquid Sands (I'll post my pics soon!). One thing that did surprise me a bit about this collection is that OPI chose this movie as the inspiration for their Soft Shades release. To me, Oz is an intensely colorful place with so many opportunities for unique and eye catching lacquers. Still though, some of these polishes are real winners in my eyes, and I will continue to wear them despite the disconnect. This limited edition promotion is available now at Professional Salons, including Beauty Brands, Beauty First, Chatters, Dillard’s, JCP Salons, Pure Beauty, Regis, Trade Secret, and ULTA, for $9.00 ($10.95 CAN) suggested retail for each nail lacquer. Products provided for review consideration. i dont like glints of glinda, makes nails with light skin tones unhealthily yellow somehow, dont like it. the rest is great except the hexas, this is somehow fail :D but nevermind, still looks nice somehow! my fav is lights of emerald city, its so sheer and jelly, like it!!!! I'm in love with Don't Bust My Bubble! And What Wizardry Is This? might just persuade me to splash out on these ones! OPI doesn't tend to stay on very long on my nails, but they're just too pretty! gorgeous swatches Sarah!! My favorite is definitely What Wizardry is This? I really like the glitters in this set! I'm happy to see some interesting shapes coming out here. OMG that Liquid Sand one is meant for me! I think this collection is a hit. I know that Oz is supposed to be colorful, but all OPI collections are colorful and I think this sets it apart nicely - I wouldn't want christmassy colors coming out in the spring! These are really pretty swatches! My picks would be Don't Burst My Bubble and Lights of Emerald City. I like the look of Which is Witch too, I'll probably splash out on these three! I love this collection and believe that it's beautiful but I agree with you. To me Oz is a colorful place as well and they could have made a really awesome vibrant and sparkling collection instead. I just ordered Lights of Emerald City. I can't wait to play with it! Lights of Emerald City and Which is Witch are pretty. I still don't know why they paired this movie with the soft shades collection, it doesn't make any sense to me. I'm SO glad you mentioned the fact that these are all so pale in color, by comparison to OZ, which you think of yellow, emerald, ruby, even the blue of Dorothy's dress/eyes. Or even the Horse of a Different Color. I'm definitely let down by the paleness of it all and may only get "Which is Witch." I love all the glitter polishes! They look wonderful! But my favourite has to be Which is Witch?. Hm...I think the curling sort of makes When Monkeys Fly have a cool uniqueness. I had the same issue with When Monkeys Fly...love the idea of it, but it gets a little dangerous having scratchy things poking up off your nails. lol And you had better luck than me with Glinda...it is exactly the color of my nails after three coats. I sent my sister a pic and she was wondering why i sent a pic of my bare nails. I didn't get anything close to the color you got! Just put on Bubble last night, and love it!